WASHINGTON – Republican presidential candidate Ted Cruz, who has been reluctant to speak ill of Donald Trump on the campaign trail, would not say on Thursday whether he told donors behind closed doors that he questions Trump’s judgment. 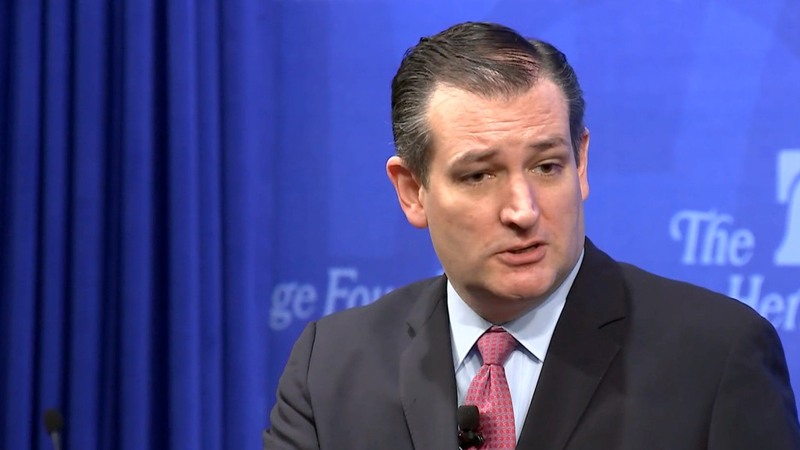 “I'm not going to comment on what I may or may not have said at a private fundraiser,” Cruz said during a speech at the Heritage Foundation Thursday. “Ultimately the decision (for voters) is who has the right judgment, experience, and judgment to serve as commander-in-chief." Cruz reportedly raised questions about his Republican challenger’s ability to be president at a fundraiser Wednesday evening, according to the New York Times. While he has said he would take a different approach than Trump on some issues, the Texas senator has steadfastly maintained that he won’t criticize the Republican frontrunner. Cruz has been careful not to offend Trump’s loyal Tea Party-minded supporters in the hopes that they might switch their allegiance to Cruz should Trump leave the race or his supporters decide to look elsewhere for a candidate. Cruz, who is well-positioned in Iowa, scored a coveted endorsement Thursday. The Family Leader's Bob Vander Plaats, an evangelical with a large following in the state whose endorsement is sought by candidates appealing to religious conservatives. In a CNN/ORC poll out this week in Iowa, Cruz came in second behind Donald Trump with 20 percent support. In another poll out the same day, the Monmouth University Poll, Cruz topped the field in Iowa with 24 percent support. The tactic of avoiding any negative ill toward Trump was evident in Cruz’s sweeping foreign policy speech on Thursday as well. He slammed “those on the right” who want to expand the bulk data collection of Americans’ communications. It’s a proposal supported by opponent Marco Rubio, the Florida senator also seeking the Republican nomination. While Cruz called the expansive data collection program unconstitutional, he notably omitted mentioning the most controversial proposal yet to be uttered this presidential campaign and the one most likely to violate the Constitution: Donald Trump’s plan to ban all Muslims from entering the United States – a proposal that most constitutional scholars have said are unconstitutional. While Cruz has stayed away from battling with Trump, he has not backed away from challenging Rubio. The Florida senator, who appeals to the more establishment wing of the Republican Party, is seen as Cruz’s biggest obstacle to the nomination. Laying out his strategy to fight terrorism, Cruz also appeared to shift his position on a critical strategy that has divided Republican presidential candidates. After previously dismissing the idea of deploying U.S. troops in Syria, Cruz on Thursday said that ground troops might be needed. While he began softening his position against ground troops in recent weeks, including on Monday in South Carolina where he said he is "keeping the door open to doing whatever is necessary to win," just last month, Cruz told reporters that putting troops on the ground is not the answer. Cruz has implied that a concern for civilian causalities should not be a priority when determining a military plan.